If you run a Volusion ecommerce store, you need to know the best practices to ensure your store is search engine friendly and can be found by potential buyers. A Volusion store SEO is not as straightforward as it is on platforms such as WordPress, because it’s not primarily designed as a CMS or content management system. It’s primarily an e-commerce platform. Yet there are still a host of options and practices that can be applied to any Volusion store to make sure it is easy to find and that it ranks as best as it can on search engine result pages. Volusion includes a very handy set of built-in SEO settings that can be found under the Marketing menu in the backend. Here, you’ll have access to some basic settings that should be optimized to maximize the search engine friendliness of your store. This is a great place to start if you haven’t done any optimization, and it can make a big difference. Meta Titles and Descriptions: On the Search Engine Optimization page, you are presented with the ability to set meta titles and descriptions globally and on a page-by-page basis. We recommend going with the latter option, since merely using the same set of meta titles and descriptions site-wide is a practice that can negatively impact your rankings. You should optimize your meta titles and descriptions on a page-by-page basis that is dependent on the kind of content on each page. All new Volusion stores have search engine friendly URL’s enabled by default. Double check and make sure this is the case for your store. It’s pretty easy to tell if your URL’s are SEO friendly. SEO friendly URL’s generally mean having URLs that are descriptive of the content on the page that they link to. Here you control the content of your robots.txt file, which tells search engine crawlers what to index and what to ignore. This is a critical setting that can make or break your performance on search engines if it’s set up incorrectly. The default robots.txt file should allow search engine crawlers to crawl the side and index it. Volusion automatically generates an updated sitemap for your store every day; generally, there should not be a need to do this manually. However, it’s recommended you visit yourstore.com/sitemap.xml to check if a sitemap is being generated. When it comes to the products on your Volusion store, optimizing the meta titles and descriptions can be a cumbersome and time-consuming process, but it is critical if you want them to be found by potential buyers. The easiest way to optimize these is by using Volusion’s Import/Export functionality. Via a Standard Export of Products, you can choose the Product Code, Product Name, METATAG_Title and METATAG_Description for all of the products in your store. It may also help to export the Product Description and Product Description Short to have existing descriptions to work off of. Meta titles should not exceed more than 60 characters or so, and meta descriptions should not exceed 160 characters. This is the maximum amount of text that will show on a search result page, so optimizing these in the available space is ideal. Avoid repeating meta titles and descriptions, stuffing keywords, and adding your store name repeatedly at the end of every single one. This can actually do more harm that good from a search engine optimization perspective. Every product should have a unique meta title and description that is relevant to the particular characteristics of that product. If you’re clever with Microsoft Excel, it is possible to bulk edit and optimize meta titles and description using formulas. This is especially useful when there are many variations of what would be considered one product. Good Meta Description: God Bless America T-Shirt with Red/Black Stripes. XS. Made in the USA, 100% pre-shrunk cotton. 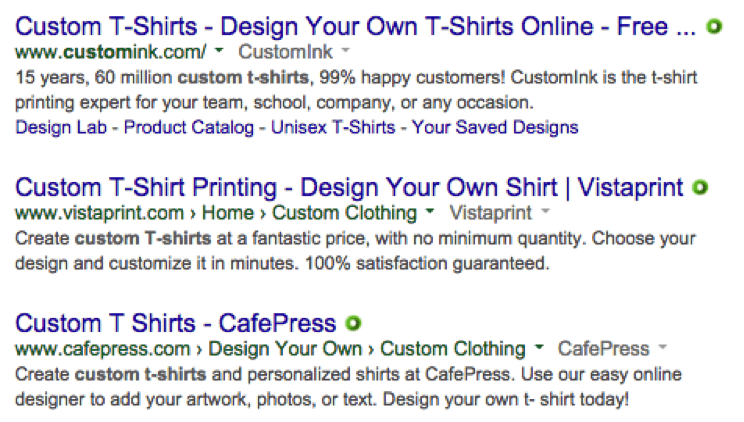 Bad Meta Description: Made in USA Cotton T-Shirts.100% Cotton. Cheap t-shirts, custom t-shirts, patriotic t-shirts, custom t-shirts, Made in America. Best t-shirts, affordable t-shirts, great patriotic t-shirts. Keeping your meta titles and descriptions clean, descriptive, and spam free is the best practice. Is Your Volusion Blog Properly Optimized? If you’re serious about SEO, then you know about the importance of content marketing. As you probably already know, setting up and managing a blog on a Volusion store is not the most intuitive thing. The most common way to set up a blog for for Volusion is to create a Blog category and then nest all of your new blogs as sub-categories below it. Every Volusion site is set up a little differently, but these suggestions hold true for the vast majority of Volusion sites and structures out there. Category Name: Should be the title of the article. Subcategory: Make sure the article is a subcategory of the blog. Category Description: This is where the main article content goes. You should include an image with every article and ensure the title for the image is the title of the article. You can hover over the image after you add it and click edit to change the title. Then, it’ll adjust its positioning. *Note: The category description should also include the title of the article surrounded by <h1> tags, which further highlights its importance to search engine crawlers. Category Description Short: Insert a relevant and descriptive meta description. Category URL Text: The custom, SEO friendly URL you must assign to the blog post. Don’t leave this blank or Volusion will generate a generic category number URL that is not descriptive of the blog’s content. Meta Tag Title: Enter the title of your article again. Meta Tag Description: Insert a relevant and descriptive meta description again. Without good data, you have nothing. Ensuring you’re tracking everything that happens on your website is critical in order to optimize it, and so is knowing what works and what doesn’t. If you’re not running Google Analytics or any other analytics platform, you need to set one up right away. Analytics gives you the insight you need to know who’s visiting your website, why they are, and how they got there. The importance of accurate analytics cannot be understated. It also allows you to track the effects of optimizations or changes. Volusion does not include any substantial traffic tracking and analytics features. Google’s Search Console tool (formerly known as Webmaster Tools) allows you to see various aspects of your site through the eyes of Google’s web crawlers. It also provides alerts and messages that let you know if something serious has happened. If you haven’t set up Search Console already, it should be the first thing on your priority list as it can give you tons of insight that can help you better optimize your website. It’s where you can check the status of your sitemap.xml, robots.txt, basic Analytics info, and site usability data. Google allows you to see if you have any duplicate meta titles or descriptions, 404’s, soft 404’s and server errors, which could all be impacting how you rank on search result pages. Keeping a squeaky clean Search Console free of most errors (especially the most serious ones such as Soft 404’s, Duplicate Meta Titles/Descriptions, and Manual Actions) is critical to ensure your Volusion site performs well. Search Console can also give you insight on how effective your sitemap.xml and robot.txt are and if they’re working as you intended them too. Successfully optimizing your Volusion store covers a lot more than just what is discussed in this guide. Whether your site is responsive (mobile friendly), fast (optimized images and code), and user-friendly, can greatly affect how your website ranks on search engine result pages. At Optimum7, we’re expert Volusion partners and developers. We know the ins-and-outs of Volusion and know how to make sure that all aspects of your store are search engine friendly. If you need help optimizing your Volusion store, please contact us or give us a call at 866-848-6072.